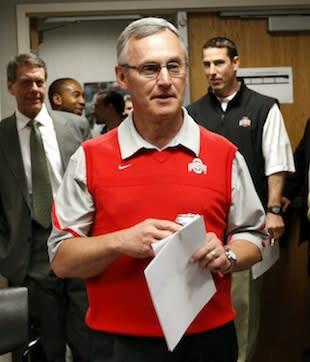 This weekend, some fans got a rare glimpse of what former Ohio State coach Jim Tressel would look like in a basketball jersey instead of a sweater vest. 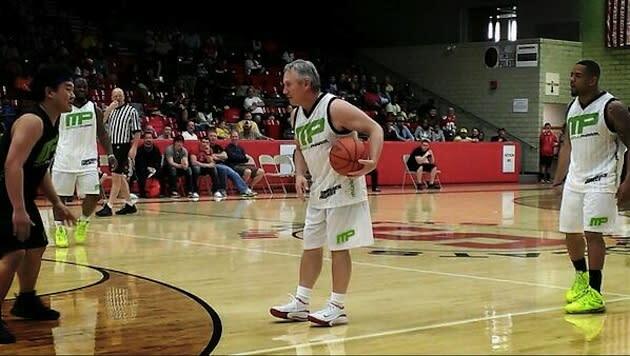 On Saturday, Tressel played in a charity basketball game in Struthers, Ohio for former Ohio State running back Maurice Clarett. Yes, the same Maurice Clarett that claimed last year that during his time at Ohio State he was “living the NFL life in college” and “got paid more in college than I do now in the UFL” all under Tressel’s watch. Clarett’s charity is called The Comeback Project, which was started by Clarrett and his high school friend Nate Ortiz. The money from the game went toward revitalizing neighborhoods in Warrenton and Youngstown. Tressel, of course, started his head coaching career at Youngstown State.